Unraveled Wednesday | For Real (again). 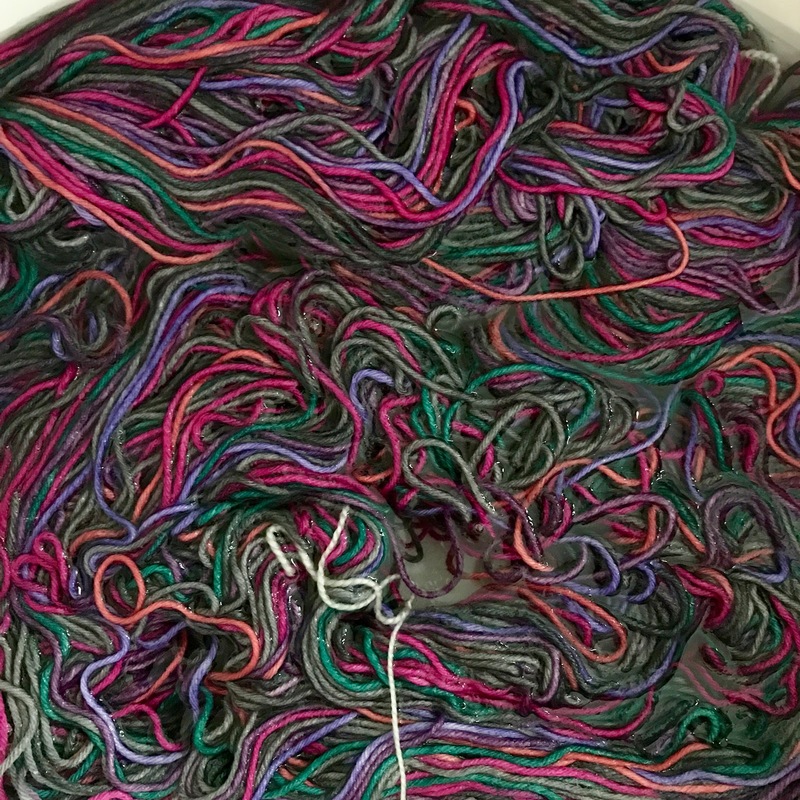 Last week I finally pulled the sock out of its months-long hibernation, took a photo and unraveled it. After a good soak, all the kinks disappeared. It’s knitting up beautifully. I finished the hat last night and started the first mitt this morning. This is the last bit of knitting I want to finish before my trip. I think I’m in good shape! I finished my Bingo reading yesterday and find myself not quite sure what to read next. Perfect timing to catch up on that last season of Sherlock that I somehow missed. Looking forward to seeing what y’all are knitting and reading this week! Unraveled Wednesday | Travel Knitting. focus friday. choose a battle. Europe 2014 | The Scarves. I love the colors in that stripe sequence and this looks like an unraveling for the better! Do you know what your weather will be like? I'm looking forward to seeing photos of your trip knitting modeled in Alaska! Perfect items for your trip! Love the colors. Next year I'm going to do a better job choosing a Bingo card – lol. I finished two books over the weekend, but no bingo for me. Your trip is so close! I think you've chosen wisely…the hat and gloves will serve you well! I somehow missed the last season of Sherlock as well. Love these colors between my hair and your hat I don't think we'll lose each other! I'm hoping my fingerless mitts will be finished at least by the time we land in Seattle-they'll go great with a hat that thankfully I already have-hard to believe we leave on THIS Tuesday! 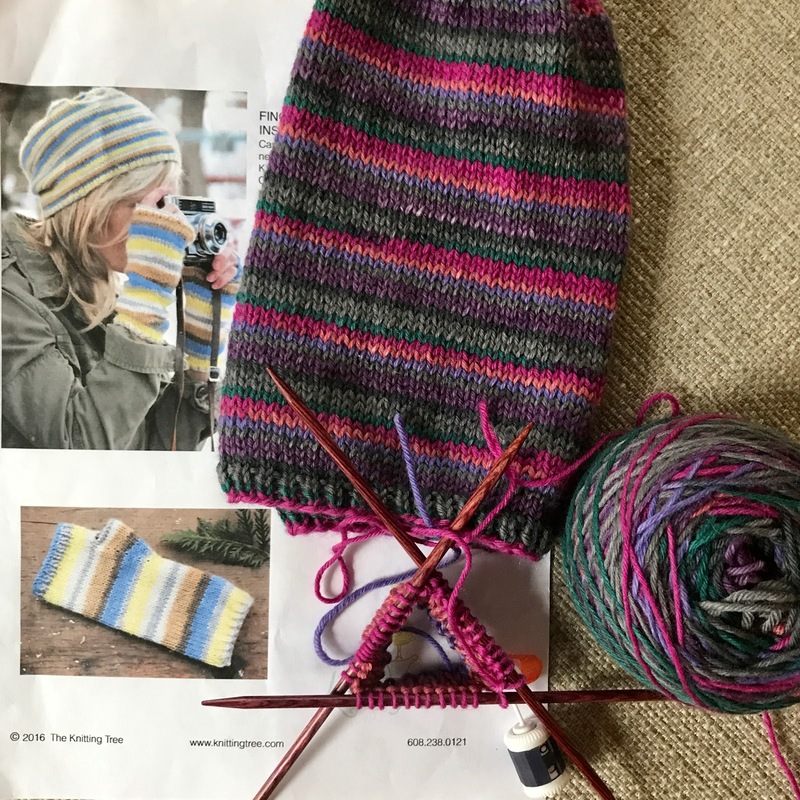 The yarn works beautifully for the hat and mitt which will be perfect companions for your trip to Alaska! You must be SO excited! That yarn will be awesome as a hat and mitts! And perfect for Alaska, too. I'm still listening to Anna Karenina. It's the last square I need for my coverall and I still hope I'll finish by Labor Day. I've had one sock waiting for me to knit up a partner for nearly 2 years and you have inspired me to just go for it, rip it out and use the yarn for something I actually want to knit! Your yarn will be perfect for the hat & mitts…great colors too! I bet you are getting excited about Alaska! I will finish up my last bingo book later today and my next book, Beartown, came into the library just in time. That is some transformation! And, I love the set – and yes, it will be perfect! well I liked them as socks but they look just as sweet as mitts. Gorgeous! Unraveled Wednesday | The Travel Report. Unless otherwise noted, all words and images on this site are my own. Please don't use anything from this site without my permission. If I've used something of yours without giving you proper credit, please let me know. Thank you!